The center of Kiev has been cleaned up and buildings have been restored and redecorated, especially the Khreschatyk street and the Independence Square. Many historic areas of Kiev, such as Andriyivskyy Descent, have become popular street vendor locations, where one can find traditional Ukrainian art, religious items, books, game sets (most commonly chess) as well as jewelry for sale. Other cultural items include the: Olexandr Dovzhenko Film Studios, and the Kiev Circus. The most important of the city's many museums are the Kiev State Historical Museum, the WWII museum, the Kiev State Museum of Ukrainian Art, and the Kiev State Museum of Russian Art. Kiev is also a great place for the food lovers, and not only those who have been fond of Ukrainian cuisine. An increasing number of international travelers, as well as the interest with which the Ukrainian city dwellers approach, have spurred a steady growth of bars and diners ranging from Japanese sushi-bars to traditional Italian and Spanish restaurants. Most famous historical architecture complexes in Kiev are St. Sophia Cathedral and Kiev Pechersk Lavra (Monastery of the Caves), which are UNESCO World Heritage Sites. Saint Sophia Cathedral is an architectural monument of the time of Kiev’s Rus. Today it is one of the best-known reference zones of the city and the first Ukrainian monument inscribed as world heritage. Noteworthy historical architectural landmarks also include the Mariyinsky Palace (designed and constructed from 1745 to 1752, then reconstructed in 1870). Mariyinsky Palace is a picturesque baroque palace on the steep banks of the Dnieper River. The Palace is the official ceremonial residence of the President of Ukraine, adjacent to the building of the Verkhovna Rada (Parliament of Ukraine). 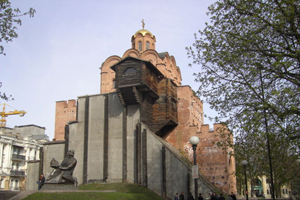 Several Orthodox churches such as St. Michael's Cathedral, St. Andrew's, St. Vladimir's, the reconstructed Golden Gate, and many others. Among Kiev's best-known monuments are Mikeshin's statue of Bohdan Khmelnytsky astride his horse located near St. Sophia Cathedral, the venerated Vladimir the Great (St. Vladimir), the baptizer of Rus', overlooking the river above Podil, the monument to Kyi, Schek and Khoryv and Lybid, the legendary founders of the city located at the Dnieper embankment. Finally, two elevated on the tall columns modern monuments to the city protectors are located at the Independence Square in the city center: the historic protector of Kiev Michael Archangel and a modern invention, the goddess - protector Beregynia. If you spend there a few days you will see here wonderful luxury hotels, huge building, malls, monuments, shops like Chanel and Tiffanies. Kiev is full of the most expensive cars, and cars are everywhere. That is one side of Kiev life. From the other on the corner of the streets or in the subway you can see old people who will be asking you for money. And even some young people in the main avenue that don’t work can come to you asking for a few cents. Bridge over the Dnieper River that was built between 1847 and 1853 by the British engineer Charles Blacker Vignoles. It has four main arches, with a length of half a mile that made it at the time the largest of its kind in Europe. 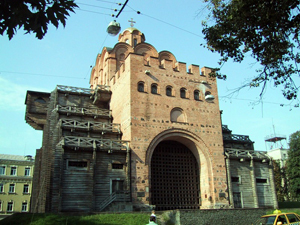 The Golden Gates are historic gateway to the ancient walls of Kiev. The Vydubychi monastery is a historic monument founded between 1070 and 1077 by Vsevolod, son of Yaroslav the wise. 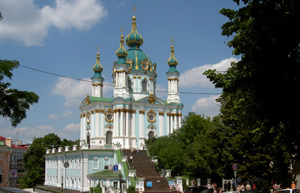 St. Michael's golden-domed monastery is currently a functioning monastery in Kiev. The monastery is located on the Western side of the Dnieper River. St. Andrew's Church, incorrectly sometimes called St. Andrew's Cathedral (Андрiївська церква, Andriyivska tserkva) is Kiev's largest baroque church. It was built between 1747 and 1754, under the design of the imperial architect Bartolomeo Rastrelli. Museum of the great patriotic war in Kiev (1941-1945) - is a commemorative memorial complex of the great patriotic war located in the hills of Pechersk district, on the steep banks of the Dnieper River. House with chimaeras or Gorodetsky House is an apartment building of Art Nouveau style, built between 1901 and 1902 by the notable architect Vladislav Gorodetsky, who is called the "Gaudí of Kiev".